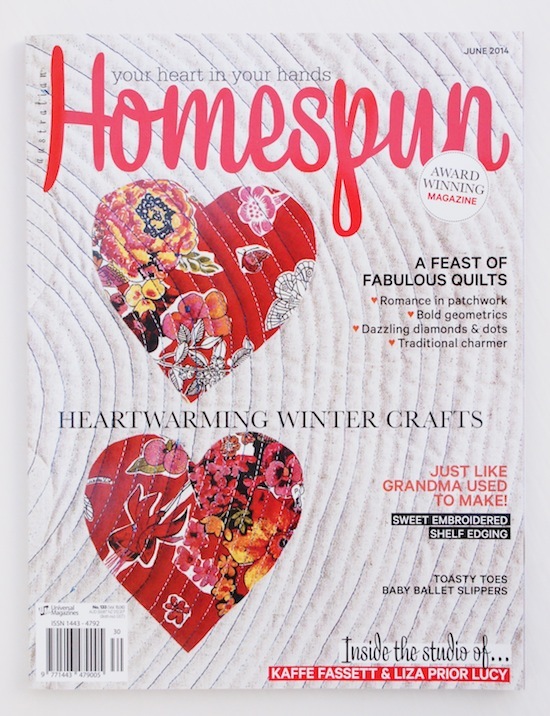 If you're not aware of Homespun magazine, it's a beautiful sewing and quilting magazine from Australia. It really is so, so well put together; featuring projects you really do want to make! 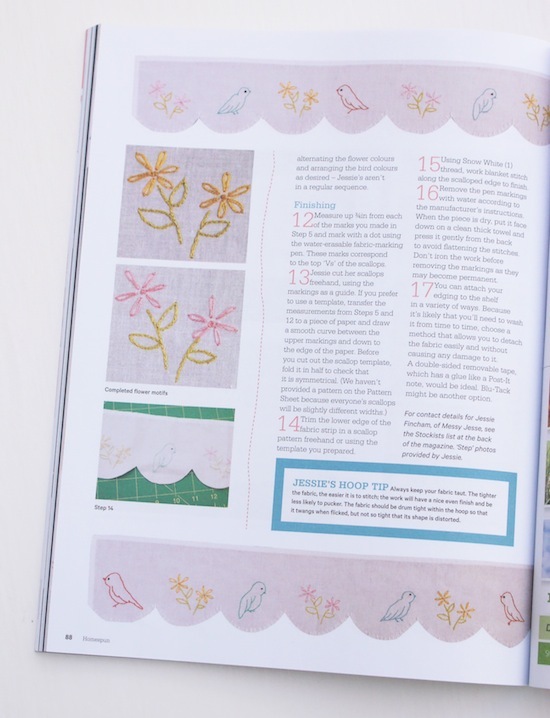 Though I know I might be a little biased saying that ;-) I was contacted by the lovely editor last year after she spy'ed my other embroidered shelf edging project I had been working on. After a little discussion I went ahead and sketched up some motifs and tested out some embroidery designs. 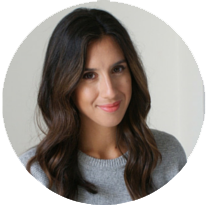 Do you remember these on the blog last year? Soon after I had two shelf edgings made, complete with cute scallop edging. So there you have it; from initial designs to the final piece :-) I'm really pleased with the article (all 5 1/2 pages of it!!) and how it's all come together. Because I worked on it such a long time ago, I'd actually forgotten how it looked so I was really intrigued as to how they would photograph the finished project, but they did a perfect job so it was such a treat receiving a copy in the post! Wouldn't it be so cute in a vintage cabinet, with some lovely china? Hopefully this might spur me on to complete my cherry themed shelf edging, which has been patiently waiting for me to finish. We shall see. They also did a little interview with me which was fun. If you're in the UK. and fancy picking up a copy, you can find it here; (although, this latest issue is not available yet) I actually purchased a previous issue from there before and it was easy and arrived very quickly. I'm not sure where you can buy it in the U.S.? but I know you can also get a digital version of the magazine too, if that helps anyone? Congratulations on your feature Jessie, so well deserved and these are just darling! I need to start getting the digital version of this magazine, you're right they really do have lovely things in that I actually want to make. I was most inspired last time I got a copy. Well done Jessie :-) The magazine looks fab. Congrats Jess! Being in Australia, I have easy access to Homespun and admired your sweet shelf edging recently! Just between you and me, I have a project coming up later in the year too! Congratulations, I love your work. 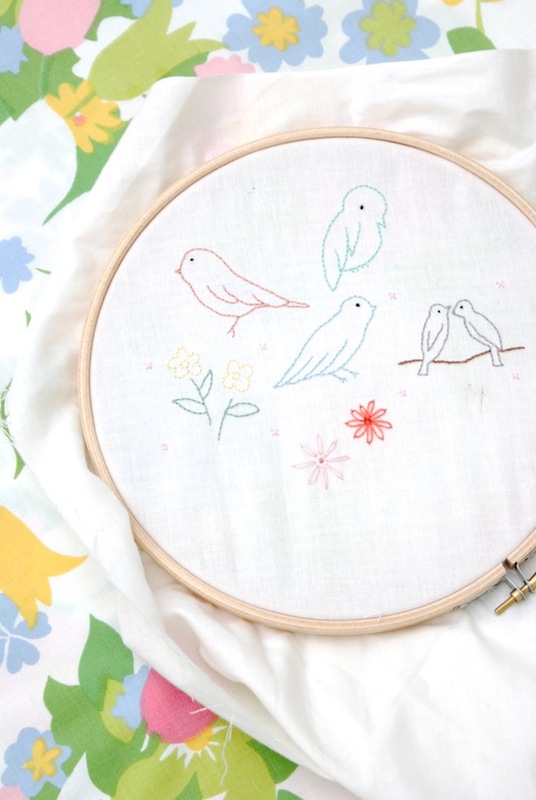 Beautiful stitchery! Living in the U.S., I never heard of this magazine, but it looks wonderful! Oh what a triumph for you Jessy. Many, many Congratulations, In an Aussie Mag as well as Brit Mags, you'll be conquering the States next,lol. You must be so proud of yourself, and rightly so, Well Done You!! Good work, Jessie! Will be on the lookout for the magazine. I love the clever idea to trim shelves with your pretty edging. Am also envisioning a skirt with an embroidered scalloped hemline.